Tanzanite is the blue variety of the mineral zoisite. It is popular for its exotic, velvety color that ranges from a rich violet blue to more purple tones. Smaller sized stones are paler - lavender to periwinkle tones. Tanzanite exhibits a mesmerizing combination of blue and violet because it is pleochroic. That means it gives you two colors in the same stone. From one angle it is seen as purple and from another, blue. What’s more, it is one color indoors and another outside. 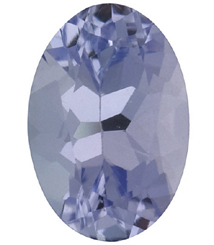 Tanzanite has a scintillating play of light refraction. The source of tanzanite is one, single finite area. It is only mined in the Merelani hills in Tanzania, Africa in a production area that is approximately five square kilometers in size. This is the only location found worldwide and prices fluctuate based on inconsistent production. Of the world’s supply of tanzanite, the prediction is the entire supply of tanzanite will be completely exhausted in approximately fifteen years. Due to the singular geological phenomenon, the chances of tanzanite occurring elsewhere are a million to one. Special care should be taken of your precious tanzanite jewelry in wear and cleaning. It can be cleaned with warm soapy water and a soft brush. Avoid contact with acids, harsh cleaning solutions, and sudden temperature changes as this may cause cracking in this somewhat soft gemstone. You’ll need to avoid hard knocks and scratches as well. Tanzanite is a new addition to the official birthstone list by the American Gem Trade Association. As of October 2002, it is an additional birthstone for the month of December. 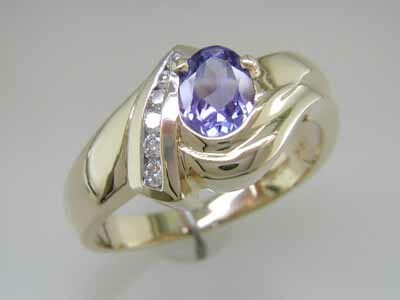 Tanzanite is also the recommended gem gift for couples celebrating their twenty-fourth wedding anniversary. Tanzanite often has a pronounced body color that is either blue with a purplish cast or purple with a bluish cast. 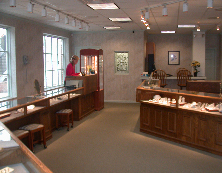 Come visit us at Laney’s today and see our selection of tanzanite jewelry. Tanzanite is truly no ordinary gemstone and has a rarity greater then that of diamonds. One of the largest mining companies in the Tanzanite market recently announced the discovery of the world’s largest single tanzanite crystal ever mined. The crystal weighed 16,839 carats (well over 3 kilograms) and measures 220 mm x 80 mm x 70 mm. The discovery was made 270 meters underground. The rough tanzanite crystal is impressive in both size and structure. The piece has been named "The Mawenzi" after Mount Kilimanjaro’s second highest peak. No value has been placed on "The Mawenzi" yet. Experts plan to carefully analyze and evaluate the crystal before any final decisions are made on the possible cutting and polishing of individual tanzanite gems from this crystal. Tanzanite was discovered in 1962 on the Tanzanian side of the border with Kenya, near the base of Mount Kilimanjaro, Africa. 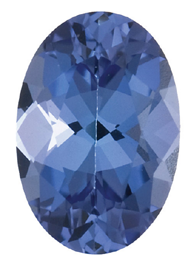 In its finest quality, it possesses a unique fine sapphire-like violet blue color. During the last quarter century since its discovery tanzanite has consistently placed within the top ten best selling colored gemstones.